Average real hourly earnings have only increased by 0.7 percent in the last four years. The Consumer Price Index rose 0.4 percent in August and at a 2.6 percent annualized rate over the last three months. By contrast, the CPI rose at a 4.6 percent rate from February to May and at a 5.6 percent rate the three months before that. Food and energy prices continue to push up overall inflation. Food prices have risen 4.4 percent in the last 12 months. Despite this, inflation in food prices has run at a 1.8 percent annualized rate since peaking in January 2009. Energy prices increased another 1.2 percent in August, but have fallen at a 2.3 percent annualized rate over the past three months. Outside of food and energy, the price of core goods and services rose 0.2 percent last month and at a 3.2 percent annualized rate since May. Core inflation has very slowly crept up over the last year, but these very modest price increases are only large in comparison to the unusually low rates seen in 2010. Core prices rose only 0.6 percent over those 12 months. Housing prices rose 0.2 percent in August, driven in part by a 0.4 percent jump in household energy. 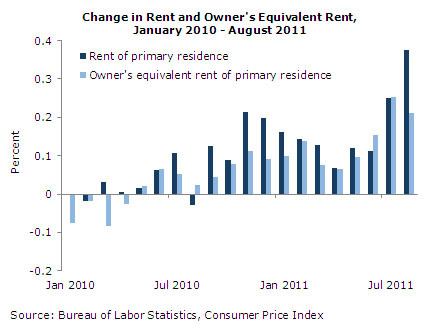 Rent of primary residences also rose 0.4 percent, due in part to the fact that rents incorporate some energy price hikes. Owners’ equivalent rent rose only 0.2 percent in the month. Transportation prices rose a more significant 0.7 percent last month, but, as with housing, contain large energy components. While the price of motor fuel rose 1.7 percent in August, the price of new vehicles remained flat for the second consecutive month. As noted in previous reports, a later release of the most recent model year has led to unusual pricing measurement and over the last 12 months new car prices are up 3.8 percent. Elsewhere in the core, apparel prices jumped another 1.1 percent in August. The 15.9 percent annualized rate over the last four months is the highest rate since early 1951. Despite this, apparel prices are up less than 4 percent in the last two years. Apparel prices have fallen 7.5 percent over the last 13 years. The Producer Price Index for finished goods was unchanged in August. A 1.1 percent rise in food prices outweighed a 1.0 percent fall in those of energy, resulting in a 0.1 percent increase in the price of core finished goods. At earlier stages of production, the story is similar. Intermediate core goods fell 0.1 percent in August, the fourth consecutive month of disinflation. Over the last three months, the price of intermediate core goods has increased at a 1.7 percent annualized rate, compared with 10.1 percent from February to May. Food is a relatively small share of intermediate goods, so energy prices drove the overall intermediate goods index down 0.5 percent in August. More than three-quarters of the index of crude materials prices consists of a relatively even split between food and energy materials, making the index very volatile. After falling 1.2 percent in July, the crude index rose 0.2 percent. A 4.7 percent fall in crude foods more than balanced out a 5.1 percent fall in energy prices, leading to a 1.6 percent rise in the core crude index. Even these core items are quite volatile in price. Core crude materials have risen 81 percent since the end of 2008, yet are only 4.7 percent above their peak of July 2008. Core import and export prices each rose 0.3 percent in August. This still-modest rate of growth was driven in part by a 0.9 percent jump in the import price of non-fuel industrial supplies—including a 2.3 percent rise in unfinished metals and a 1.7 percent rise in finished metals. The former had fallen in the previous two months. Core nonfuel, nonagricultural export prices rose 1.2 percent after falls of 0.1 and 0.4 percent in the previous two months. Despite a 15.3 percent increase in these prices over the past year, they remain only 7.9 percent above their peak of September 2008. With another fall this last month, the average real hourly earnings of all employees has fallen 2.0 percent from its peak in June 2010 and increased only 0.7 percent in the last four years. At this pace, it will take until sometime in 2062 to see an increase in real earnings of just 10 percent. As long as this slow growth in earnings remains along with weak job growth, there is no reason to expect much domestic price pressure. Worldwide commodity prices and a falling dollar, however, may contribute to inflation—particularly in the short run.